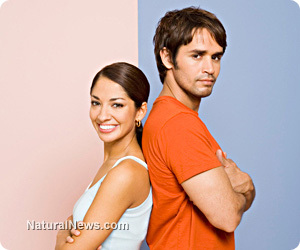 (NaturalNews) You don't have to be single to wonder whether or not you are ready for a relationship. In fact, millions of people who aren't really ready find themselves in the middle of relationships that are going....badly. Regardless of your status, you should understand the following 10 signs because they indicate whether or not you are ready to do what you are doing, or about to do. Once you understand your limitations, then you can go to work on them and ready yourself, if you want. Ignoring these 10 signs is the beginning of trouble in paradise. Something goes wrong. What's your first instinct? For many of us, it is to blame someone or something outside ourselves. This may be human nature in action. It is the next step that really kills relationships. After initially blaming, you set up a fortress of psychological defenses to cement the blame in place. Acting defensively automatically turns your partner into an enemy. It's hard to feel close to an enemy. If your initial reaction is to blame, then put all of your efforts on letting go of defensiveness, coming around and acting like a team player. You're in a relationship, so you introduce the others as: my wife, my husband, my girlfriend, my partner, and so on. "There are different ways to use the words my and mine. A. The original, romantic use of mine was a term of endearment. My dearest, my beloved... You are mine in that I love you. B. Here's another way: I OWN you! Using my or mine in the sense of ownership is risky business in relationships. You are my husband, so you have to do what I say. You are my wife, so you have to put up with me. I own you, so you have to cooperate. Investing in endearment leads to intimacy. Investing in ownership leads to separation. Does your romantic partner have some feedback for you? Does she have to call in National Guard to help make her point? Being open to feedback and constructive criticism is essential in any partnership. In a romantic partnership, such feedback can hit home in devastating way. For example, perhaps your partner is not satisfied in bed and wants you to step up your game. How dare you suggest I am anything but a total god in bed! If you're not satisfied, it has nothing to do with me! Again, defensiveness isn't going to solve the problem and neither is hanging onto your false sense of superiority. Work together with your partner to resolve things and improve your mutual experience of being together. Ah, the passive aggressive...You think you want to avoid conflict, so you agree with whatever your partner says. Then, you do whatever you originally had in mind. This, of course, leads directly to massive conflict! It also destroys your emotional connection and makes an untrustworthy liar out of you. No one wants to be in a relationship with an untrustworthy liar. Putting friends and social life in front of your primary relationship is a common way to avoid relationship problems - and intimacy, too. Social butterflies, both men and women, sometimes need to learn that making a romantic commitment means letting go of other commitments. Refusing to scale back your social life in favor of an intimate partnership may mean that you aren't ready. I don't know if this syndrome is listed in the DSM-V, but it means that you think it's funny to pass gas, belch, swear like a sailor, pee on the toilet seat, leave your dirty underwear lying around, chew with your mouth open and generally make a childish nuisance of yourself in front of your partner. You may even think her disgust is cute. It's not. Her disgust means she actually finds you to be a disgusting person. Next, you'll want her to make love to you, right? If she does, she might be grossed out by that, too, thinking back on your antics throughout the day while you are getting your thrills at her expense. 7. You are a self-centered, petty, sociopathic narcissist. Romantic partnership is sharing a life together. Sharing a life means sharing stuff, sharing time, sharing emotions, sharing responsibility. It will involve some sacrifice of your individual desires. That sacrifice should pay dividends, as the two of you are creating something beyond what either of you could do alone. So, you can't keep all of your selfish desires satisfied while simultaneously working toward your mutual goals. Have you ever been around a narcissist? It feels shockingly dismissive. If you partner is feeling this way, then your relationship is a ticking time bomb, believe it or not. Things go wrong. What are you going to do? Fix them. Work together and do your best as a team. If you tend to whine like a mule, that will break down your team. Now, in addition to dealing with problems, your partner has the added burden of dealing with a whiner. Whining is a sign of immaturity and it doesn't serve a purpose in a healthy relationship. Emotional martyrs are those who shoulder too much of the burden and refuse to ask for support. This leads you straight into resentment of those around you, who obviously are to callous to lend a helping hand. Again, in relationships, teamwork is the name of the game. Martyrs make teamwork impossible. If you cannot express your needs and give others the chance - and even make demands - then you might not be ready for a healthy relationship. Do you like to cooperate with others? Or, is your nature more along the lines of, "Stuff it, pal. I do things my way. Stay outta my business. If you're my partner, then really stay out!" A lot of guys think of themselves this way. Surprisingly, many women do, too. Here's the deal:. You only think you are a glorious, independent rebel-type. In fact, by refusing to cooperate with others (that you have agreed to cooperate with, by the way) you only invite continual monitoring (of you). In other words, when you don't play by the agreed upon rules, people will naturally intervene, trying to get you back on track. You are just asking to be monitored, controlled and nagged when you refuse to cooperate. So, you love to be controlled. Not a great quality in a partnership. Are these signs deal breakers? No one is issue-free. We all have our difficulties. The bottom line is whether or not you are aware of yours. Then, can you be honest, adapt and adjust your behavior accordingly? In relationships, I tend to be a martyr, but I'm working on it. If it ever feels like I am moping around resentfully and refusing to accept help, feel free to call me on it. I have a tendency to whine. So, if I ever whine, you can ask me to stop and I will do my very best. I tend to exclude the ideas of others and want to do things my way, period. I want to work together with you, so if you feel like I am being a rebel, just say so. If you have issues, you can be in a healthy relationship. Own them and take responsibility, relieving your partner of the burden of your "stuff." As a person, I am not issue-free...so when I mess up, my goal is to see it, own it, make different choices and work together with my wife. To the degree that I am successful in this, my relationship is healthy. Beyond these concerns are those of relationship compatibility. Compatibility is a foundational concept that most people actually ignore when making commitments. Why? For several reasons. Sometimes it is emotional desperation. You can't stand being alone, so you commit to whomever you can as soon as you can. At other times the problem is ignorance of how to evaluate a relationship's potential. If you wonder whether or not you and your partner really have what it takes to succeed and what to do to resolve your incompatibilty, then you must check out the Dating, Relating, Mating program. Read more here. (Over an hour of free education). If you like this post, then like my Facebook Page to keep up with all my writing. Mike Bundrant is the author of Your Achilles Eel: Discover and Overcome the Hidden Source of Negativity, Bad Decisions and Self-Sabotage. Click here to learn more.